Toys and perches are very important for your parrot's health and well-being. They're more than just for your parrot's entertainment, although that is a very important role as well. They provide necessary exercise to your bird's beak and feet! Having a huge cage for your parrot is great. But if that huge cage isn't extensively filled with perches and toys, it is just as well a tiny cage. The main advantage of a huge cage is that there is an opportunity to put a lot of perches for your parrot to move around on and many toys to motivate it to come to. Without them, you'll just have a parrot sitting in one part of the cage all day doing the same as it would if it were in a smaller cage. Perches are the foundation of your parrot's living space. The bird spends all day on its feet. Having a good variety of different perches provides diversity and comfort to your parrot's feet by allowing it to change and choose its perching. Forget about dowel and plastic perches. Throw them out. They are no good for your parrot. Take caution of natural perches that are straight and smooth as a dowel. Just because they are natural, doesn't do any good if they act the same way as a dowel. I would strongly encourage you to offer all four types so that your parrot has the most variety and choice. Wood perches should be the Natural perches are fun because each one is different. The diameter, texture, and shape will vary. This is great for your parrot. Unfortunately, you don't always know what you are getting when ordering online and some natural perches don't offer all of the advantages of being natural. Sometimes it isn't possible to make wildly wavy perches properly fit the rectangular orientation of a bird cage. For this reason, I came up with and patented the NU Perch. These perches offer the maximum amount of variation, choice, and comfort while also being totally safe and affordable. Provide a variety of different lengths, thicknesses, and hardness of perches so that your bird can experience different perching techniques as it moves about the cage. Rope perches and cement perches are good additions to wood perches but only in moderation. The cement perches can help keep your parrot's claws trimmed and it's a different texture than all other perches. However, excessive use of cement perches can greatly irritate the bird's feet. Never put a cement (or other sanding type) perch where your parrot sleeps. In other words, don't put the cement perch up high or where your parrot goes a lot. Ideally, place a cement perch in a place your parrot visits just a few times a day. For this reason, a cement perch serves very well by the bird's water (bottle or bowl). It only takes a few drinks a day but otherwise does not spend an excessive amount of time in that area. Rope perches are the exact opposite of cement perches. Instead of being hard and harsh, rope perches are smooth and comfy. This is a good thing but in moderation. Rope perches can provide relief from firmer perches. But if used excessively, they may cause the bird's feet to be too sensitive on harder surfaces. Also, extreme caution must be taken if the bird chews on the rope perch. Two major hazards can be caused by chewed rope perches. First of all, some birds ingest the rope and can develop a crop infection. Another hazard is that the bird can get its foot or claw caught in the chewed strands of rope and get stuck. So, to avoid either case, inspect the rope perches regularly and replace preemptively if there is any sign of damage. Just as perches are to your parrot's feet, toys are a health requirement for your parrot's beak. Parrots use their beaks quite extensively in the wild for feeding, nest cavity making, and playing. We won't be providing nesting opportunities to our pet parrots but we should nonetheless give them lots of chances to chew. Toys are a good human alternative to the chewing challenges that parrots would encounter in the wild. Abundance of toys is very important. Different shapes, textures, materials, and challenges will keep your parrot and its beak busy in different ways. Some materials such as plastic are tougher and will require harder chewing than softer materials like wood. Providing variety and abundance will improve your parrot's activity and provide the pleasure of choice. Perches can also be a source of chewing pleasure and beak exercise. My parrots love the NU Perches in their cages not only because they are comfortable on their feet but also because they provide a reasonable chewing challenge. On one hand, the perches are soft enough that the birds can chew them if they choose to. On the other hand, they are tough enough that it takes them a while to really destroy them. I don't know why sometimes they leave perches alone and chew only toys and other times focus on the perches instead of toys. But by providing them the abundance and variety, I can ensure that they are kept busy, happy, and healthy in any case. Keep in mind that the best deterrent against developing a feather-plucking problem is keeping the bird busy chewing things that are not on its body. Just because there are toys in the cage doesn't mean they are serving much useful purpose if they don't end up in a pile of splinters on the bottom of the cage. Looking, touching, and playing with the toys is only a small portion of their purpose. Getting the beak and mind exercised in the process of chewing them up is the biggest purpose. In the case of most parrots, something is going to get chewed up at the end of the day be it the bird's toys, perches, your furniture or stuff, or its feathers. In order to avoid it being the feathers or furniture, it is best to focus on toys and perches. Some toys are just too difficult, thick, hard, or boring for your parrot to chew up. 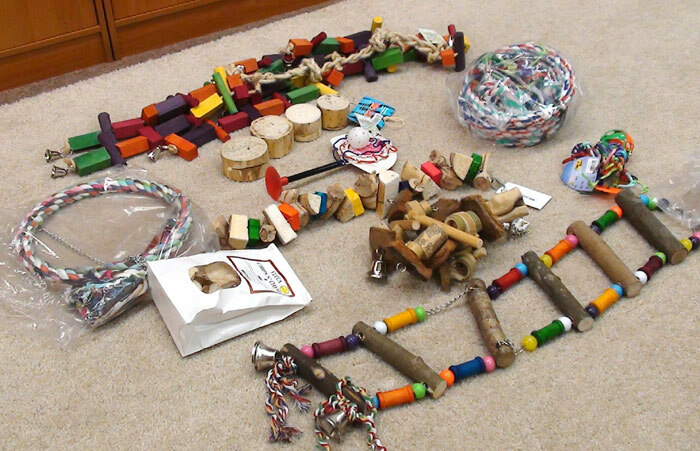 Offering a variety of different kinds of perches is a good way to improve the likelihood of the toys working out. However, sometimes the parrot just won't chew any of it up. The best way to get it started is to get smaller or easier toys that are meant for a smaller species than what you have. Letting the bird have success with a toy that is too easy can give it the motivation to tackle some of the tougher toys that are meant for its size. The toys gotta get chewed up in order to be serving their purpose. Every parrot is different so what works for some parrots may not work for others. Let your parrot exhibit its own personality and develop its own preferences. Provide abundant variety of perches and toys so that it can make the most of them and grow its choices.